METRO Manila hit its highest heat index or human discomfort so far in 2019 when it hit 40.8 degrees Celsius (C) on Saturday, the state bureau said. The Task Force Bangon Marawi (TFBM) has been given the go signal to start the debris clearing inside the “most affected area” of this war-devastated city. As many as 6,000 policemen would be deployed for election duties in the towns and cities of Western Mindanao for the May 13 midterm elections. Authorities have confirmed the death of Maute leader Abu Dar in an encounter with the military in Lanao del Sur. The Department of Environment and Natural Resources (DENR) is monitoring the cleanliness of top tourist destinations in the country ahead of the expected rise in tourists during Holy Week, a DENR official said Sunday. Netizens slammed skin whitening brand Glutamax for a series of online ads it uploaded on Facebook on Saturday, April 13. The Department of the Interior and Local Government is questioning the United States list that included the Philippines among the countries with the highest risk of kidnapping and hostage taking. Environment group EcoWaste Coalition on Saturday, April 13, called for a zero-waste observance of Holy Week, saying it was the perfect time to reflect on wastefulness. An imposing 15-meter statue of Jesus Christ at the Divine Mercy Shrine here may have helped introduce religious tourism to this idyllic town, but it may not approve of visitors peering out in skimpy attire during Holy Week. Rappler on Sunday slammed President Rodrigo Duterte’s recent allegation that investigative journalists are being paid to attack and stir up issues. Former President Fidel V. Ramos has lauded Ramon Ang, president of San Miguel Corporation (SMC), for undertaking various mega projects including the USD15 billion Bulacan International Airport that will generate over a million new jobs. President Rodrigo Duterte on Saturday, April 13, said he advised the Navy to blow up the vessels of drug smugglers. The Bureau of Immigration (BI) has urged overseas-bound travelers this Holy Week to leave early for the airport. President Duterte has criticized the Metropolitan Waterworks and Sewerage System for their lack of preparation for El Niño. The Sandiganbayan convicted former officials of the Department of Finance (DOF) for multiple counts of graft, sentencing them to 30 years to 70 years of imprisonment. Damage to agricultural products due to the threat of El Nio has reached P5.7 billion, an official from the Department of Agriculture disclosed on Sunday. Vice President Maria Leonor Leni Robredo on Sunday slammed the Department of Energy (DOE) for supposedly failing to prepare for the anticipated increase in demand for electricity during the summer season. They grace our P20 bill, take center stage in tourism ads, and form the backdrop of many a souvenir photo. 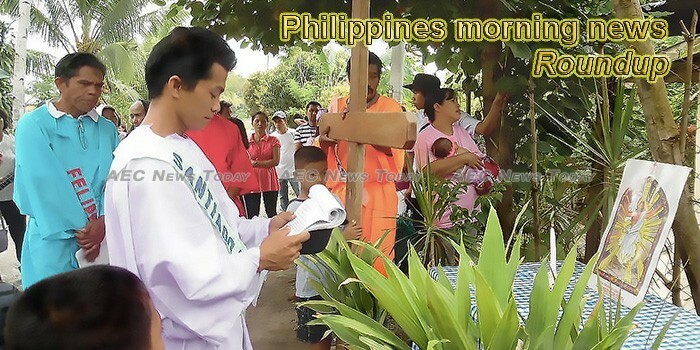 This week’s Philippines Morning News feature photo acknowledges Good Friday, April 19. We wish all of our Philippines readers a safe, healthy, and enjoyable Easter.